London based bar group Drake & Morgan’s brief for their latest 2015 venture was simple, “the best cocktail bar in Kings Cross”. In the swish environment of the Kings Cross redevelopment, which has seen dramatic changes to this part of London, gaining that title was going to be no mean feat and for it they needed something really special in terms of its interior. Indeed, one of their stated ambitions was to win the coveted Best Interior category in the prestigious GQ Magazine Food & Drink Awards for 2016. 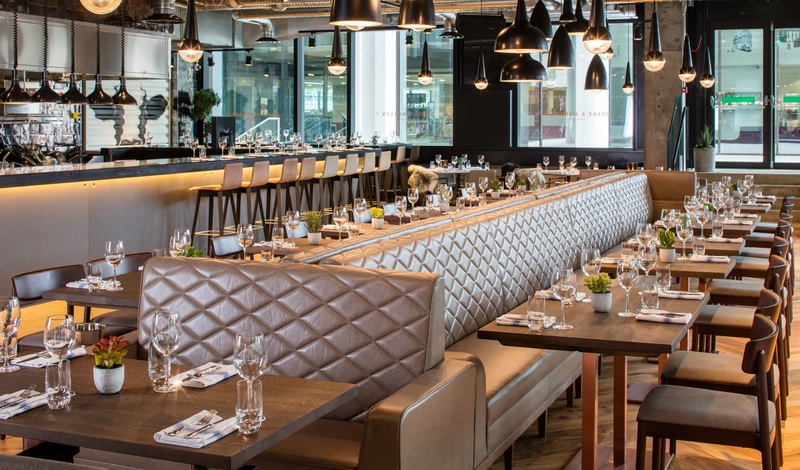 They would be up against stiff competition given the quality of recent interior design in the capital’s bars and restaurants as well as trying to top previous accolades, their existing ventures having been shortlisted as Best Designed Multiple Restaurants in the Casual Dining Awards 2014. So whether attracting customers, being hailed “the best in town,” or winning awards, the bar had been raised, the challenge was on. Priding themselves on being “bold and innovative” Drake & Morgan’s interiors have to reflect this and who better to realise this than the designers at Fusion DNA. Drake & Morgan specified a “familiar but different approach” for their new venue. 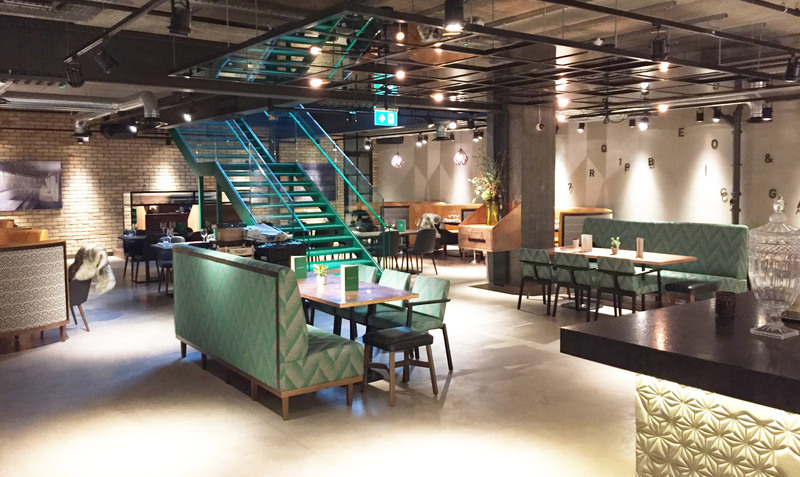 Comprising a bar and restaurant on two floors (plus outside terrace), target customers included commuting office workers and business people with an enticing appeal for them to work remotely away from the office, so the interior layout had to facilitate this. On the lower ground floor circular booths provide dining spaces for small groups slightly separate from the hustle and bustle of the spacious lounge area where busy commuters can work remotely while sampling the culinary delights on offer. Fluted back seating in a warm coloured leather combined with a metal framed fabric outside back detail really does look great! 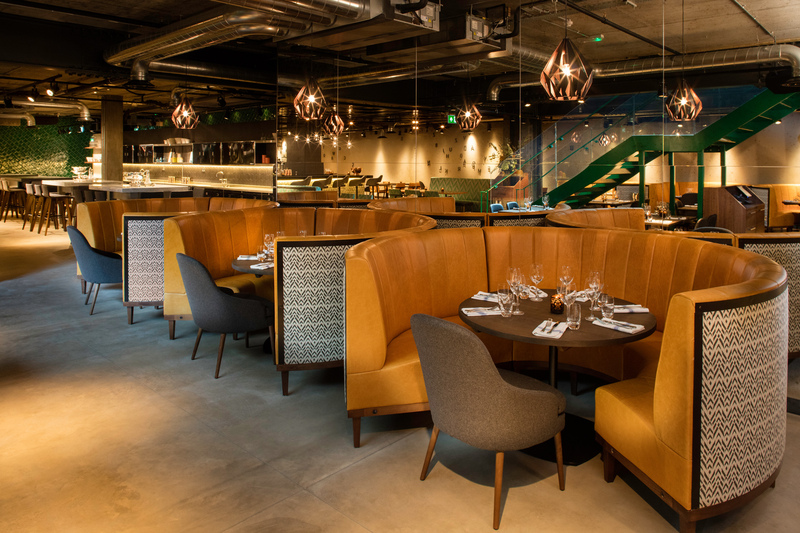 The space for customers at Drake & Morgan at King Cross is ably demonstrated in the above view of the lower bar area, note the zig-zag fabric marking out the plain back seating as something a little out of the ordinary. 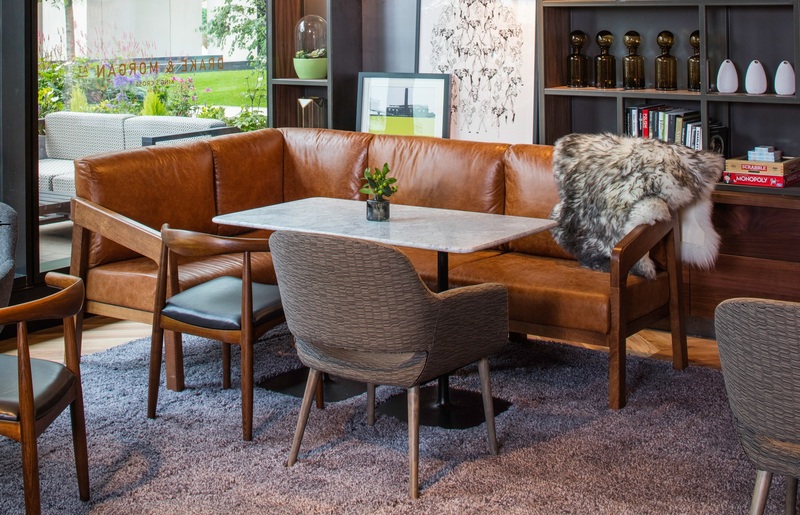 By contrast the elegance of the Craftwoods’ diamond stitched seating in a mushroom coloured leather complements the look and feel of the light and airy upper ground level. Settee-style seating with bespoke wooden frames with arms and comfy seat backs lend a real sense of stylish home comfort for customers who wish to settle down with a drink and maybe a game of Monopoly on their lap top. With their new premises Drake & Morgan’s appeal to busy commuters was to “escape the everyday”, and the interior certainly meets that requirement. The venue was soon picking up customers in increasing numbers despite the presence of already established venues in the same niche being close by. Pundits were quick to predict the capacious new bar and restaurant would become highly popular, particularly with office workers. Drake & Morgan place a lot in store by their interiors and with Fusion’s design and Craftwood’s expertise and quality of manufacture in evidence it certainly succeeds on that front. With its “exceptional decor”, as one patron enthused on TripAdvisor, and others praising its “attractive ambiance” it was soon declared “one of the best places to go in the area”. Will it become the best? The signs are certainly promising. And as for the GQ awards the new interior certainly places them as a strong contender.